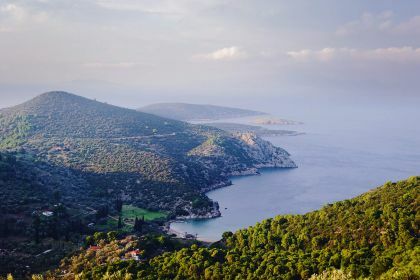 Densely forested Poros is a picture-perfect island in the Saronic Gulf boasting beautiful beaches, pastel-coloured neoclassical buildings and ancient ruins. A narrow strait, not much wider than your typical river, separates Poros from the mainland and Aegina and Hydra are just a short sail away. 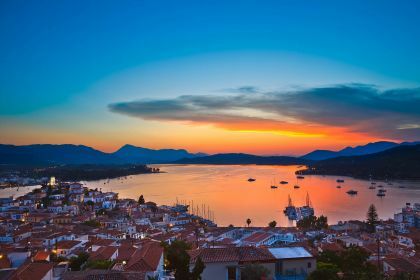 Call or contact your friendly Abberley charter broker here for assistance in planning an unforgettable yachting vacation in Poros and the Cyclades. 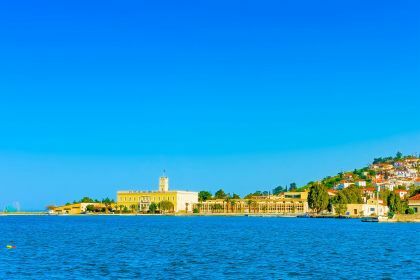 With Athens about an hour away, Poros is an ideal base from which to explore the city’s ancient offerings – and the pace of life here is much less hectic. Sailing down the narrow straits between Poros and the Peloponessos feels like sailing down a river or one of Venice’s canals. Boats are anchored in forested coves, swimmers splash about in the clear water and people sip drinks and tuck into food at the tavernas lining the shore. Poros town and Galati bustle with life and have some great artisanal shops and restaurants. And when you want some tranquillity, all you have to is wander down to your yacht and recline in luxury. Russian Bay, five kilometres from Poros town, is a spectacular place to drop anchor and explore the ruins of a 17th-century Russian dockyard, set right on the beach. Wander the cobbled streets of Poros town and pick up local fare such as fresh fish, local wines and exquisite hand-made weavings. Small and secluded Love Bay beach, set among trees and with clear emerald water, is another stunning place in which to drop anchor. For a larger, more organised beach, Askeli is a swimmer’s paradise. Taverna Poseidon is the epitome of a Greek fish tavern, serving huge portions of seafood and fresh salads, with spectacular marina views and traditional Greek dancing. Kanali Beach Bar and Restaurant has a fresh, all-white outside area right on the shore and a menu offering fresh seafood and excellent steaks. For one of the best moussakas on the island, try harbour-side Taverna Gia Mas in Poros, and to swap stories and dine on excellent seafood, the Yachting Café has a cosmopolitan ambience and wonderful marina views. Poros has a lively nightlife during the summer months, with many cafes and bars on the seafront open until the wee hours. The beach bar at Love Bay is a beautiful spot for sundowners, as is Malibu Bar in Poros town, right next to the water. For the more energetic, Pirate Bar in Parikia old town is a vibrant, quirky spot filled with cosy alcoves and a great cocktail menu. 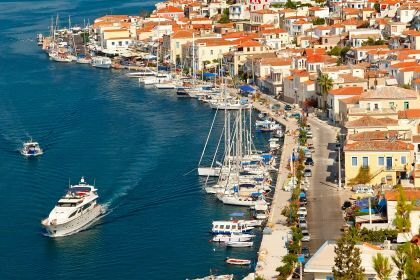 Ready to explore delightful Poros and other thrilling destinations in the Saronic Gulf? Contact our friendly Abberley broker here or by phone. We will help you find the yacht that fulfils all your dreams. Insider Tip: The small, winding streets of the upper village in are home to some excellent restaurants frequented by locals and travellers in the know.